Face painting is not only an art, it’s an adventure! Together with our creative face painters, children (and adult children too!) 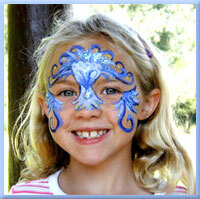 come up with the most fascinating face-painting forays! And not just dots and spots! How about dragons and dandelions? We have amazing artists that can transform your guests into princesses, tigers, a spider man, and other-worldly heroes and villains!! Animals, butterflies, flowers, and faeries are all possible too. What will they come up with at YOUR event? For immediate assistance and answers to your questions, please give us a call!